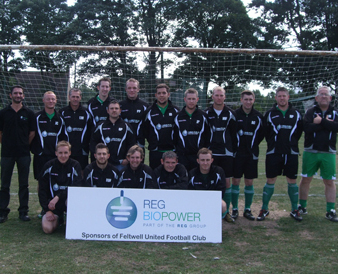 Living Fuels, in partnership with parent company, REG Bio-Power, are proud to announce their sponsorship of the Feltwell United Football Club. The team practice near the birthplace of Living Fuels, and therefore were a natural choice for sponsorship. After winning Division Two and then continuing their success by storming through Division One of the Central & South Norfolk League, Feltwell United applied for the Anglian Combination League and were accepted for the 2012/2013 season, starting in Division Six. The team have since been promoted to Division 5 for the 2013/14 season and are currently sitting at the top of the division, after winning their first four games. A reserve team was recently formed and has been promoted to Division Three of the Central & South Norfolk league for this season. Recently, the club was also awarded the FA Adult Chartered Standard Club status and have revamped their premises for this season including the construction of brand new changing rooms. The club’s target is to continue improving both on and off the pitch each season and to progress to the top of the league pyramid.